Try this pomegranate chicken recipe for a savory and sweet dinner idea. Food blogger Jenna Weber shares her inspiration for this unique tasting dish in a full post on the Fresh Tastes blog. Heat the oil over high heat in a large sauté pan or cast iron skillet. Once hot, add the chicken and brown on all sides (this will take about five minutes). Remove chicken with tongs and transfer to a plate. Set aside. Reduce the heat to medium and add the garlic, sautéing until fragrant---thirty seconds should do it. Then, deglaze the pan with the red wine vinegar. Cook for another minute or so until most, if not all, of the vinegar has been cooked off. Add the pomegranate juice, molasses and chili powder. Bring to a simmer and cook until mixture has reduced by about half. Slowly drizzle in the cornstarch slurry (cornstarch and water), whisking constantly. Once the pomegranate mixture has reduced and is relatively thick, add back in the chicken thighs and finish cooking in the sauce. 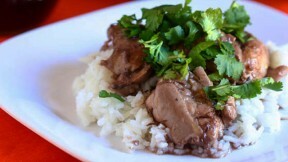 Serve chicken with sauce over a bed of fluffy jasmine rice with parsley on top.